Get Clean. Stay Clean. : Synthetic Marijuana?!? These products are being widely used, especially by young people. Many of my patients report either that they have used them or they know people who do. There are coffee shops and other places that are openly allowing these products to be used; some are even supplying the smoking paraphernalia like pipes and hookahs. The products are very available to purchase online and in local head shops and even tobacco shops. They are sometimes being used instead of natural marijuana because they will not usually cause a positive drug test. Some new drug tests are being developed to test for these new products. No one really knows what is in each product. Each manufacturer puts in whatever they believe will sell more of their product. There is no quality control. Each batch is different. Many consumers seem to believe they are buying and using a ”natural” product. Some companies even claim that these products are natural and therefore they are healthy and good for you. The main ingredients are not “herbal products” at all, but chemicals sprayed onto a variety of plant materials. The chemicals used have names like cannabicyclohexanol, JWH-018, JWH-073, and HU-210. Most were synthesized in the lab as experimental drugs for research. They were never intended to be used in an unsupervised way. The safety margins between a safe dose and a toxic dose have not been established. These drugs attach to the brain’s cannabis receptors. Some are reported to be more than 500 times as potent as THC. While they do work on the cannabis receptors in the brain, most of the chemicals also work on other parts of the brain and we don’t yet know anything about these other effects. There are a number of adverse effects reported from these drugs. Emergency rooms are reporting a large increase in visits for patients with toxic effects. At low doses, they seem to cause an increase in heart rate, anxiety, and aggression. At higher doses, there are reports of overdose, confusion, seizures, psychosis, and suicidality. Some therapists are reporting that clients are relapsing using these products. Some of the clients believe that they haven’t relapsed because these are natural products and are not against the law. There is no way for consumers to tell what drugs are actually in the products they are smoking. 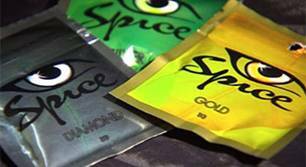 So the question is: what should be done about these new synthetic marijuana products? When it comes to the legal issues associated with substances of abuse, there are a number of points of view and a number of factors to be considered. On the one, hand it is true that criminalizing marijuana and other drugs has not led to dramatic reductions in their use. It is certainly true that the criminal element does get involved with the whole drug business and this has its own set of serious problems. It is also true that people who want to use drugs are very resourceful and will usually find ways around most of the barriers that society puts up to stop them. On the other hand, these are new chemicals and we have no realistic idea just how they work, what are their adverse effects, or what are their toxic doses. They may easily cause permanent brain damage or have other serious long-term consequences. So, from a legal standpoint, there are only a couple of options. We could allow them to be legal and have them be controlled by some kind of state agency. But this is simply not realistic at this point. We don’t know enough about the chemicals themselves, and if one of these products was later found to have serious adverse effects, it would be disastrous. We could look the other way and allow these products to be used in the way that they are currently being used. But this option suffers from the same problems as legalization. We just don’t know enough. We are also in danger of sending a powerful unhealthy message – not just that we can’t control drug use, but that we have given up trying and that we don’t care. The only real option at this point in time, in my opinion, is to make these products illegal. We need to accept that our attempts to make them illegal will be met with counter measures from the drug manufacturers and the users themselves. It is an ongoing cat and mouse game that will never end, but that doesn’t mean we shouldn’t try. As a society, we need to stand for the fact that there are products out there that are not good for us. We should definitely study these products. The more we learn about them, the more we will understand about drugs of abuse and the whole process of addiction. We may even find that some of these products are quite safe and some may have therapeutic benefits that far outweigh their risks. At The Coleman Institute, we are dedicated to helping people adopt a sober lifestyle. If you or someone you love is in need of detox off of alcohol, opiates, benzos, Methadone, or Suboxone, please do not hesitate to contact Jennifer Pius or Amy Stewart at 1.877.773.3869 today. We're here for you! I Work with a GREAT Group of Doctors!